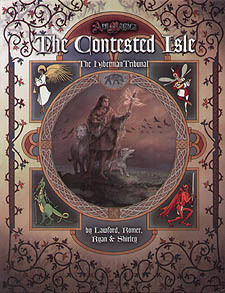 The magi of Hibernia respect the land and its supernatural inhabitants, granting much of the Tribunal's area to hedge traditions and allowing supernatural creatures a vote at Tribunal. Now, magi from elsewhere in the Order have come to "reform" the Peripheral Code, laying siege to and taking one of the Irish covenants. If the native magi could only stop fighting each other, they would resist. As English lords push further into the island, and the Church struggles with attempts to make it fit continental ideals, the Order of Hermes faces its own conflict. The traces of past conflicts are everywhere: the faerie Tuatha De Danaan, the magic Fir Bolg and Formorach, and saints as prone to curse as bless. Demons, however, are nowhere to be seen, as constant fighting convulses the Emerald Isle. It is, as ever in Ireland, a time for heroes.